We’d been planning a shake-out hike with our Duluth backpacking crew for a while. It came down to Easter weekend at Siloam Springs. Lee and I had gone there last fall for my birthday. As a destination, it had several important features: we could drive there before the kids went critical in the car; the entire backpacking loop was 4 miles, which both kids could do; it had enough small interesting things to keep the kids occupied while being interesting enough for the adults. On the flip side, there was no water at the site. The weather was supposed to be high 60s during the day, 40 at night. A bit chilly for a little one perhaps. It wasn’t a huge destination hike, but it was perfect for our needs. Saturday we meet at 7:30. Three adult Ospreys, one “big” kid Osprey, and Boo’s little REI Sprig went into the Explorer’s trunk. I squeezed between the booster seats and officiated “I spy” and “are we there yet?” for 2.5 hours. We arrived, paid for a site (from the car campground hosts), and picked up trail “maps” from the office. J kept looking for the scale on the map so he knew how far things were, but there wasn’t one. It may not have even been to scale. Luckily, it’s pretty easy to not get lost. We parked by the west trailhead, took a pit stop, ate a snack (very important to feed the kids before hitting the trail), and we were off. 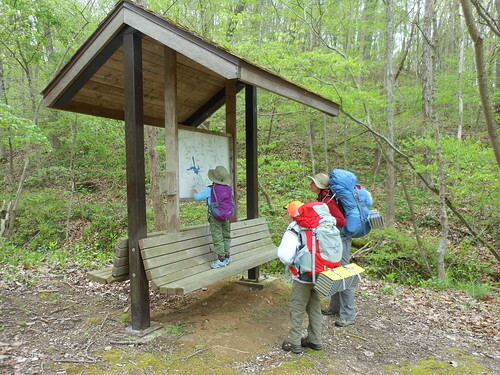 We walked along the road to the eastern trailhead, and the kids eagerly perused the trailhead map. The east trailhead starts with a long hill. It’s not that steep, but it is long. Boo and J alternated running and stopping to look at sticks. We lost D only a few yards in to a flower he didn’t recognize. Nor was it in our “flowers of Illinois” pamphlet. Take a (few dozen) picture(s), look it up later. Boo found and discarded several hiking sticks. D stopped to take pictures of every dogwood we passed. The kids hike very erratically, stopping often, sprinting often, stopping to poke at things. Lee and I just stayed with the group, and we traveled like a well-oiled herd of cats. Near the end of the hill, Boo and J found something. “Hey, come look at this!” “What is it?” “I don’t know! It looks gross!” They had found a dried out morel mushroom. It looked like it had escaped from a mushroomer earlier. I was lamenting the loss when D came up. “That’s salvageable. It won’t be perfect, but it’ll perk up enough to eat if we soak it.” It was tucked into a mesh pocket on Boo’s bag. The spring beauties and mayapples were blooming at the same time. It’s been a weird spring that way. D really wanted a picture of both. So we walked past a patch of mayapples he found ideal for his picture-taking purposes. “I’m going to have to drop my pack and be a real wildflower photographer here.” We all knew he was going to lay down in the dirt. As a good friend, I immediately got my camera ready. 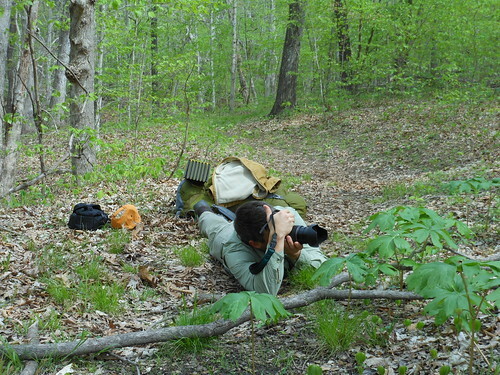 He set up his shot, I crouched down and tried to get a nicely composed shot of my own. I shifted… and fell over, turtled up by my pack. At this point, one can either curse and get mad, or laugh. I was already in a good mood. I laughed. He turned, saw me, and took a picture. We met a few mushroom hunters. Boo especially wanted to talk to all of them, and show off our poor shriveled mushroom. The kids were tired after the hill. J wasn’t used to his pack and was asking to stop for lunch every log or flat spot. I was walking with him at the back and finally told him that he could mention a spot once, and no more. We were looking for a lunch spot and he would have to be patient. As we fell farther and farther behind, and he complained more about how heavy his pack was, I took his 2 almost-full water bottles from his pack. With that weight reduction, we caught up and kept up to the rest of the group, and a few minutes later found a good stopping place. Coming around a curve along the top of a ridge, the view opened up over a steep hillside, with a stream and fields at the bottom. Just off the trail was a large log, perfect for a Lee and Boo to sit on to eat their lunch. Boo ate a hard-boiled egg while I made tuna pitas for the two adults. J and D had packed themselves sandwiches. Turns out a packet of tuna is about 2 pitas worth, not 1, so we had some leftovers. Tuna pita, hard-boiled egg, some root veggie strings (what are they called? ), and we were off. We might have lingered, but it was just exposed enough for a chilly breeze, and when the clouds started blocking some sun, it was time to keep moving or start digging for more layers. We moved. After lunch, the kids had a lot more energy. We clambered down a rocky track to the soggy lowlands. Up in the hill we could see small cliffs and overhangs. We hiked through some mucky areas, and hopped a few rivulets. After a bit we came to the ruins of a stone building. A doorframe was still standing, but most of the other walls had fallen down. The whole park used to be a mineral springs resort thing. After that, there was a shorter hill, but still tough for the kids. After lunch is not their best time. The trail flattened briefly, turned, and opened up to the fire lane. When Lee and I had been there last fall, the fire lane was very freshly bulldozed. Now, winter weather and spring vegetation had softened it into a boulevard of a trail, but more trail than construction zone. 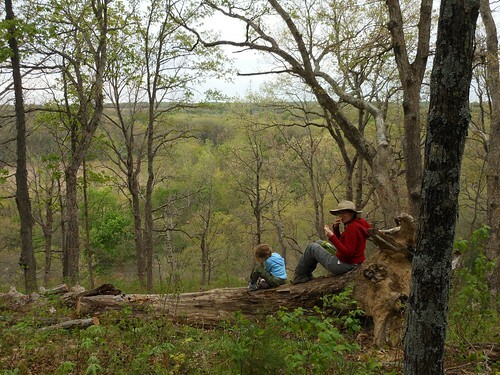 The kids were reaching the end of their lunch perk up, and the trail was still gently climbing. Boo held our hands and got a tow up. And then, “I see it! That white sign up ahead, that’s the campground!” The kids ran. 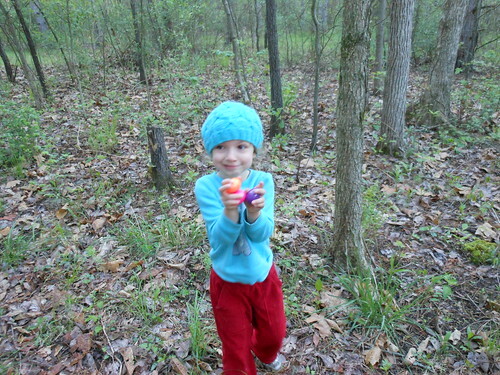 After a pit stop, we carefully perused all four campsites and picked site 4. We shed our packs at the picnic table and started lazily clearing sticks from our chosen tent sites. “Did you feel that?” “A rain drop?” “…. Maybe….” The tent pitching took on some intensity. Not much, as it was barely raining, but we stopped dawdling. Tents pitched, we tried to get Boo to rest. She was having nothing to do with it. Lee and I laid down, Boo escaped. The Krauses were being quiet in their tent. 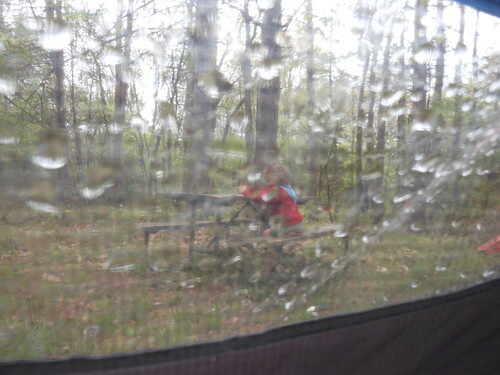 Boo sat quietly at the picnic table in the drizzle while we all rested. After the drizzle let up, we all emerged, had a snack, and took a hike. Because, well, why not? We explored down another trail, and got down to the river that borders the park. We discussed various ways to cross the river. Do we make a zip line? Do we take a boat across to build a bridge? Do we shoot a line across with a bow and arrow? Do we bring the goat or the fox or the chicken? After that rather interesting discussion, Boo declared she was too tired to continue and wanted to go back to camp. I said I’d take her, and before we’d gone ten steps, J was coming with us. DvA and Lee kept walking, and the kids and I walked back to camp. The kids both whined a little going back up the hill, but I got them looking for navigation information points (blazes, signs, things that look familiar) and interesting things. J had been reading his survival guide during our nap time, and I had him tell me about what he’d read. Apparently the first chapter is “How to get un-lost”. “OK, what do you do if you get lost?” “…. Um, there’s a lot… it’s kinda complicated.” While that can be true, you are 8 and you need to remember the basic steps first. “Boo, what do you do if you are lost?” “Sit down or hug a tree, blow on your whistle three times.” J admitted that his book had said that, but a lot more stuff too. I was surprised that she remembered the “three whistles”, as I’d mentioned it once to J that morning. We do teach her and have her practice staying put and blowing her whistle, but we don’t expect her to remember it if she actually feels lost yet. And they both sprinted back to camp. J was excited to use his pocket knife to whittle. He’d had a whittling workshop with Cub Scouts where they carved on soap, but he hadn’t done any or much actual whittling on sticks. He had gotten permission to whittle with supervision, and I said OK. We reviewed the safety rules, and he remembered them all with just a little prompting. Boo was constantly wheedling for a snack until I hung the food. There are no bears, but it keeps the food out of reach of raccoons, other critters, and my kid. Then he and Boo collected pinecones. They decided to pile them in the fire ring. Then they decided to gather sticks “for the fire”. I told them I didn’t think we were going to have a fire. They said they’d gather sticks anyway, just in case. And if we didn’t have a fire, it would be ready for the next people. Then Lee and DvA arrived. “Huh, looks like we’re having a fire tonight.” There were a couple very excited kids. They brought pine needles for tinder, and went increasingly farther afield in search of sticks. Luckily for them, the backpacking sites don’t seem to have very high usage so there are lots of good fire sticks around. Once the fire was going well, the adults started dinner. We use a Trangia Mini. 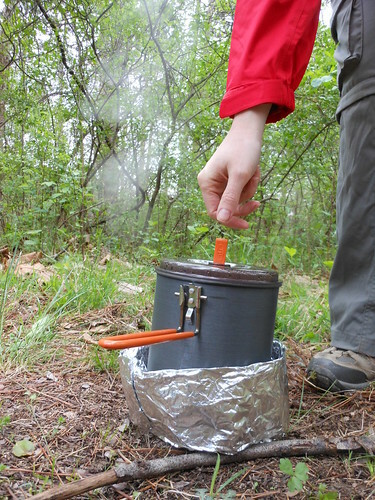 This trip was our first with a GSI Dualist pot. We eat out of Squishy Bowls. 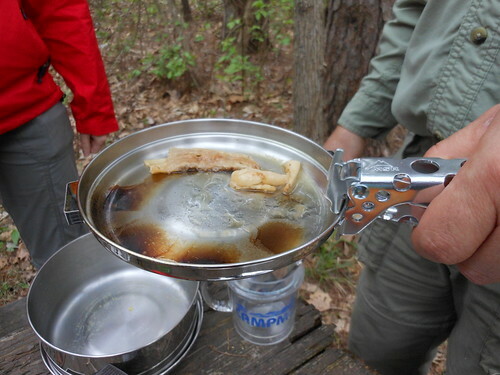 DvA has a new canister alcohol stove of some sort. It has a reflector base. Lee wants one. I cleared a spot on the ground for our stove, and realized that we had to resize the windscreen for the new pot. So I folded the tinfoil down to fit under the pot handle. Lee cooked. The new pot has a strainer lid, so as the water boiled steam came out only on one side. It was pretty neat. Dinner was tasty. The soup was a lot soupier than Lee usually makes, but it hit the spot on a rapidly cooling evening. Boo didn’t eat as much as we were expecting, but she doesn’t eat as big a dinner as other meals, so we didn’t worry about it. D fried up the morel for dessert, though both kids declined. More for the adults! We didn’t even try to get Boo to sleep before dusk. We had decided last fall that, since Boo always ends up in Lee’s sleeping bag anyway, and since we got new bags that zip together, we’d just stick her with us. She’ll be warm, it’s where she ends up anyway, and it’s less weight and expense than bringing her a bag. So I snuggled her up. She was wiggly and chatty. Typical over-tired. I may have fallen asleep before she did. “Birch. Birch, wake up.” “Unh.” “Will you take her potty?” “Unh? Oh, OK.” I take her out of the tent, and she’s crying. “Shh, baby, shhhh.” She doesn’t calm down or wake up or stop whatever is making her cry as much as I was expecting. She must be tired and not happy to be out of routine. Or else cold, I’m pretty chilly. Mission accomplished, I snuggle back in, already more asleep than awake. “Birch. Birch, is the ibuprofen hung in the tree or can you get it?” I am suddenly a lot more awake. “She has a fever.” Luckily, the ibuprofen was in the tent, not in a tree. Lee works on calming her back to sleep while my mind crafts ever-more-improbable scenarios. When I’ve gotten to the worst-case I can think of, I finally sleep. As usual we made Boo’s breakfast first. 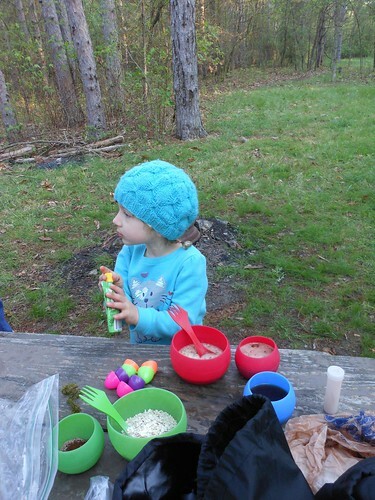 A packet of oatmeal, a cup of cocoa, a squeeze-pack of applesauce and the contents of her Easter Eggs. And she barely ate any. Lee and I had oatmeal with nuts, dried fruit, and chia seeds. Tea for Lee, coffee for me. As we ate, Lee and I discussed our options. We felt that she probably could walk out. 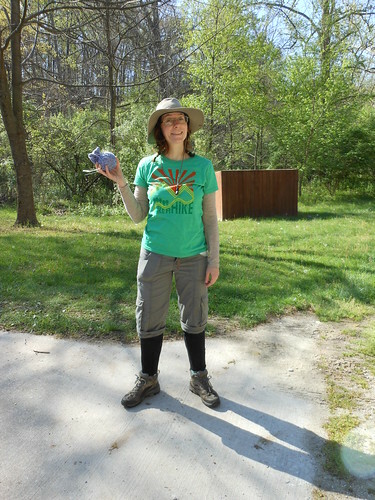 But we don’t want her first backpacking overnight to be a miserable death march. And she would get whiny. So we packed up my bag early and quickly (wet tent and all), and I hit the trail while the rest of them broke camp at a more reasonable pace. I could only do this because the trails are pretty straightforward, and I’d done this trail before. (I have not had to develop great navigational skills.) I went down to the truck fast. Once there, I grabbed a last big swig of water, took my fanny pack and the belt from my pack, and headed right back up the trail as fast as I could go. I got up most of the hill and about half the distance to camp before I spotted DvA coming around a bend. Boo’s trudging along holding Lee’s hand, looking miserable. Lee reports that Boo has been OK holding Lee’s or DvA’s hand, but had started to get whiny. She’s used to riding piggy-back (it’s the only way I can carry her anymore), so I knelt down and got her on my back. Then I carefully strapped my pack belt under her bottom and over my shortribs. Her legs were inside the belt over my hips. This would probably have been sufficient, except I was not convinced she wasn’t going to fall asleep. So the belt of the fanny pack went under both our armpits. That way she could relax, enjoy the ride as best she could, even sleep if she wanted. Once she was settled, I didn’t worry about leaving anyone behind. 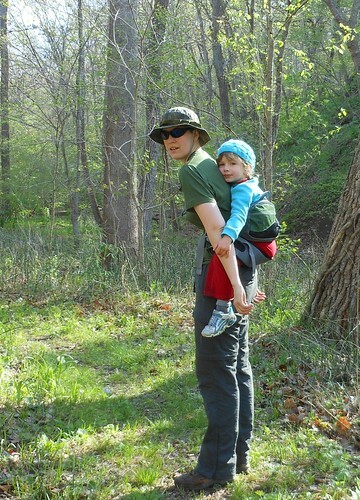 At 37 pounds, she’s significantly heavier than my pack, and the belt around my ribs got uncomfortable quickly. It was better than carrying her in my arms or on my shoulders, but it wasn’t anything I could do for hours on end. When we got to the car, I fed her some nibbles from the trail mix out of my pack. The rest of the crew arrived shortly, and we headed home. Boo missed three days of school. But she wanted to go backpacking again. Win. What was your first overnight like? Hi Birch! You're kids sound so much like mine! My son is also in cub scouts and also loves to whittle -- though he did more of that last year. My son and I both have Osprey packs (though mine is 10 years old and canvas), and my daughter has an REI pack we just bought for our last trip this summer because she insisted on carrying her own things. And she did -- with absolutely no complaints! Our first trip out this year was the weekend right after school was out (late May) to a favorite backcountry spot just about 3 1/2 miles in. I haven't written about that short over-nighter yet. It was just me and the two kids. I am so glad they like backpacking. They are always asking when we are going on the next trip! The boy's a cousin, but he and Boo make a good team. She has loved carrying a tiny backpack since she could toddle, and she loves planning and packing. Her complaints about the pack correlate better to heat than pack weight or hike distance. She loves carrying her own stuff. I think we're going to try to squeeze in one more overnight with her this fall.